Memorial Plaques 8 1/2" x 11"
Send us an email if you have questions. Photo engraving for personalized gifts and memorial plaques. You may email your photo to us for a free evaluation. In turn, we will analyze your photo to make sure it is laser etching quality. Use this link to email your questions or to send us your photo for evaluation. We can use your digital images or we have the ability to scan an original photograph up to 8 1/2" x 11" inch size and create a digital image for you, free of charge. Your original photograph is not harmed during the scanning process and will be returned to you with the shipment of your order. Once we have the image in digital format, we then process the image through our engraving software. The image is then laser etched onto the surface of the black marble and becomes permanent and will not fade. Please supply us with the best quality photo that you have of your subject. The better the photo that you supply to us the better the job we can do. We cannot fix out of focus and blurred photos. Some adjustments can be made within our software to adjust for brightness and contrast. We have the ability to remove the background surrounding a subject in a photo with our Photo Background Removal process. There is an additional charge for this feature. This option can be selected during the check-out process during ordering process. For digital photos we prefer GIF, TIF, BMP file formats. The image should be saved with the highest resolution possible without the file size exceeding 2.5Mb. Please don't compress the image before sending to us, in most cases this will cause a loss of photo clarity and it cannot be recovered once the file compression occurs. We will gladly work with JPG file formats but photo clarity is lost with this file format. 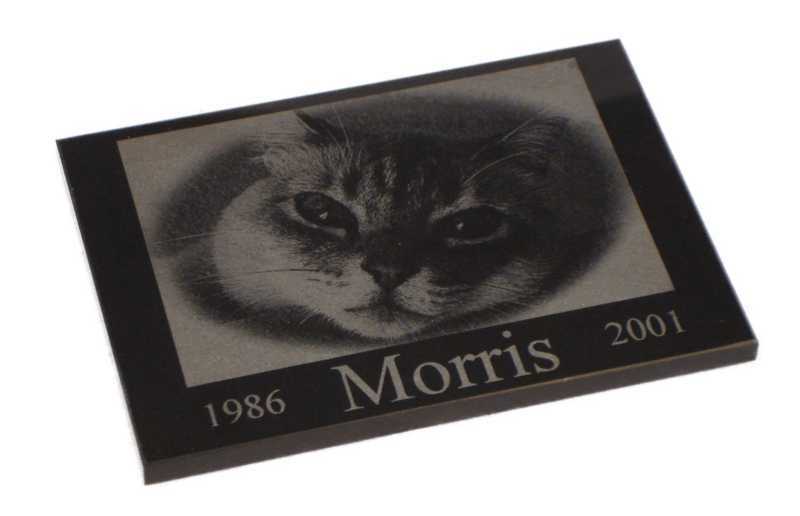 Photo Engraving on Black Marble 8" x 10"
Memorial Plaque for Pet 5" x 7"
Included with each order is photo optimization. We will adjust your images to achieve the best results for the laser engraving process. We will use the latest software to remove dust & scratch marks and make the proper adjustments for brightness and contrast. Your image will be adjusted to properly fit the size of marble you choose. Background removal is available at an extra charge. Not all photos are good candidates for the laser etching process. Feel free to submit your photo to us for a free evaluation. 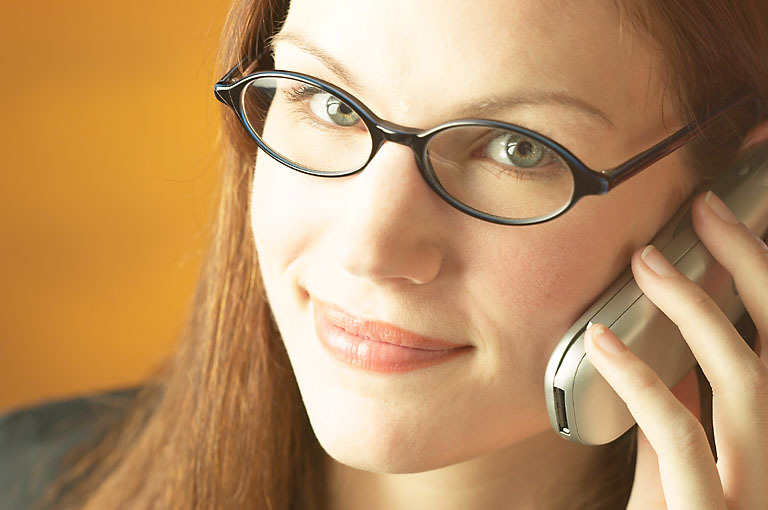 Use our contact page to email us with your questions or comments. Photo engraving is the process of reproducing your favorite photos onto black marble using a laser engraving machine. 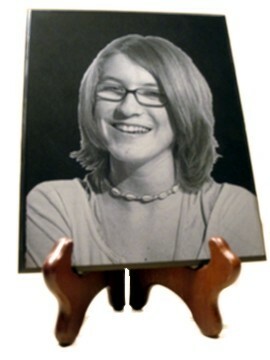 Photo engraving is great for personalized gifts and memorial plaques. The photo engraving is permanent and can be enjoyed for generations to come. We start with the highest grade of pure black marble that we can find. The surface of the marble is polished to a gloss finish and then we add your image with our laser engraving equipment. 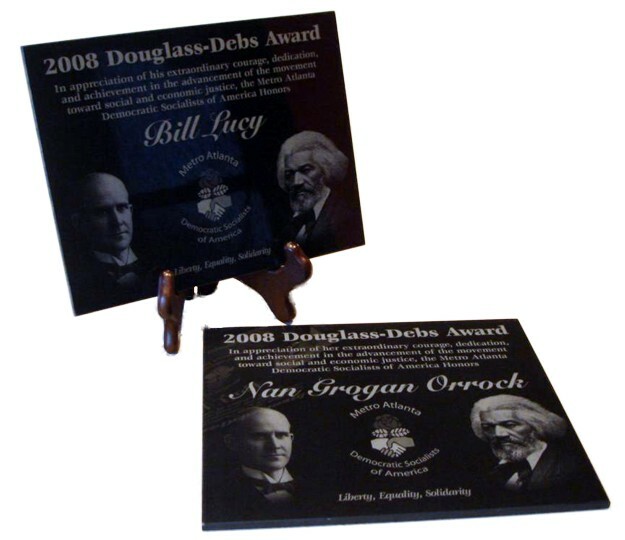 The results are quite stunning for a personalized gift or memorial plaques. 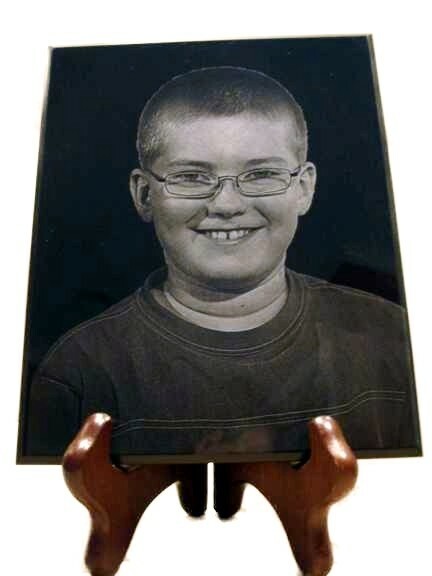 Photo Engraving on black marble makes a wonderful Personalized Gift for Family and Friends. Memorial Plaques can also be created for a beloved family member or pet. 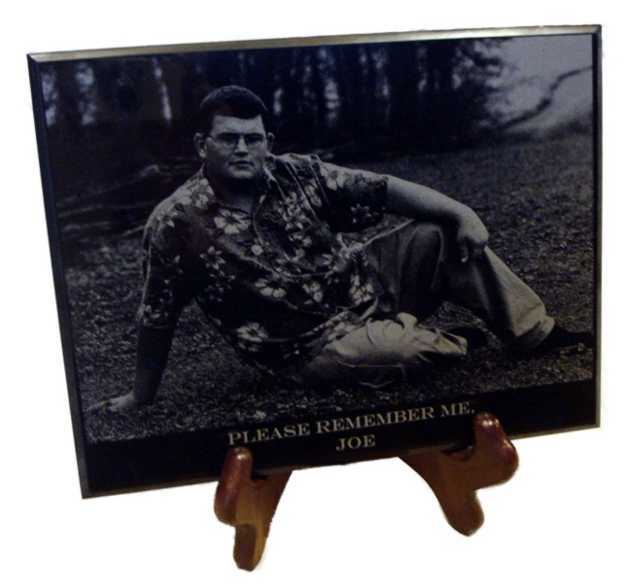 Photo Engraving on black marble 8 1/2" x 11"
Plaques normally ship 3-5 days after you place your order. 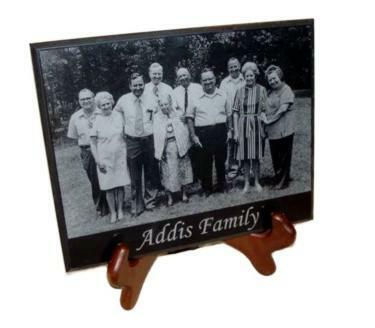 Thank you for visiting our Photo Engraving - Personalized Gifts - Memorial Plaques page.